毎日何気なく前を歩いていた消防署。よく見ると、“Heritage Building” だった。Heritage Buildingは現在バンクーバーに2,500程ある。Heritage Building とは築２０年以上で文化的伝統価値を持っていると Heritage 委員会に認定された建物。Heritage Building はこのようなパネルが組み込まれていて、建物の歴史的背景を読むことが出来る。それによれば、この消防署は1907年に建設され、北米で一番最初の消防車を格納できる消防署だそうだ。もうすぐ、１００歳ですねぇ。１世紀に渡り、お疲れ様です! I pass by this fire hall every day without paying much attention. I had a close look and found it was a “Heritage Building”. There are about 2,500 heritage buildings in Vancouver. 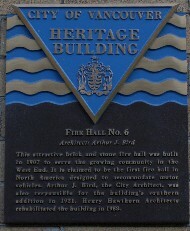 Heritage buildings are more than 20 years old and they are approved by the Heritage commission for its heritage value. Heritage buildings have this kind of panels and you can read the building’s historical background. 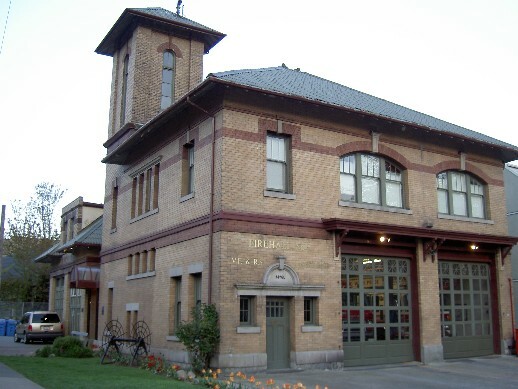 According to the panel, this fire station was built in 1907 and it is the first fire hall in North America designed to accommodate motor vehicles. The building is going to be 100 years old soon. Thanks for serving the community over a century!